The future of Android is here. Android M (I’m still hoping for Muffin) is the software that will power Android smartphones starting this fall. Aesthetically, everything looks familiar, but there’s a lot buried under that Material Design exterior. Let’s take a look. Google’s Senior VP Sundar Pichai introduced M saying that Android focused “on polish and quality” for its newest release, which comes out in a few months (though the developer preview drops today). One of its first big updates was app permissions. This gives users the right to accept and revoke permissions to apps for enhanced security and privacy. Permissions are managed through a new dashboard where you can go through and pick and choose what an app can and can’t do. Google also says that this will make updates to apps for developers more seamless and painless. Basically, a win-win. Android is also bringing Chrome Custom Tabs to Android. What all that insidery mumbo-jumbo means is that apps can now run closely with the Chrome browser, having the app actually running over top of the app itself. But this also means that you get some of Chrome’s excellent capabilities such as saved passwords, autofill suggestions, and multi-process security. Developers can now link between apps, so you don’t have to stare at that infamous “Open With?” menu option. This means it goes right to app because Android to check apps to make sure it supports the capability. Android just saved you a click. One of Android biiiig updates for M is Android Pay. As its simple name suggests, it’s just like Apple Pay, the tap-to-pay service for iPhones. The actual card number is never shared with the merchants and can use all major credit cards. Obviously, NFC is needed for you to use this neat-o feature at 700,000 stores across the U.S. Read all about it right here. Of course, secure payments means Android needs a secure way for authentication. Yep, fingerprint sensor support for Android. And when we’re talking “polish and quality,” hopefully that would mean extending battery life—something every smartphone in the world could use. Android has a new feature called Doze. With Android M, the device will use motion detection to see if it’s been left alone for an expended period of time. If it has, the smartphone will go into a “deep sleep.” This will essentially trade off app freshness for battery life but will still be able to sound off alarms and delivery high-priority messages like always. Google says they loaded two Nexus 6s, one with Lollipop and one with M, and the new software gave the M-powered Google phone double the battery life in standby. Ok, you have my attention. But that’s not all the charging news. USB-Type C is also coming to Android (obviously), which is expected news but great news nonetheless. Google’s also been hard at work toiling away on Google Now by inviting tons of third-party developers to join in on the convenient virtual assistant. However, in Android M, it’s getting even better. You can now double tap on the home screen which basically tells Google Now you need help. This is called Now on Tap (: /), and Aparna Chennapragada, director of the Google Now team, went through a few scenarios using the new M-powered Google Now. You can check the name of music artists, quickly create Google Card reminders to pick up laundry, learn more about a movie some just emailed you about, or helping you not sound like an idiot at a fancy Italian restaurant. Also, you can use it in Chrome by tapping on things in the browser you have questions about. All great things! We also got a good look at the new Photos app for Android (and also iOS) that’s been born from the ashes of Google+. Now that it’s untethered from the Google’s limping corpse of a social network, you get its best feature stock on Android. This means facial recognition powers, seamless sharing, and an improved editor and storage interface. But the biggest news? Free unlimited backup for photos and videos. That’s zero dollars, euros, yen, pounds, or whatever! It’s also available for iOS, Android, and web starting later today. Read more about it right about here. 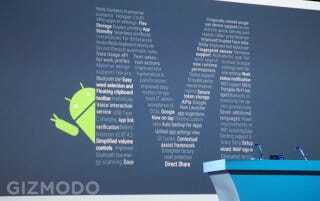 When Dave Burke, the vice prez of engineering at Android, closed out his speech, he said that M is all about “the little things,” and that’s seems true. It’s some fine-tuning here and there, but a necessary step to make Android that much better.